application form along with the relevant documents and the signed photograph is on or before 25-10-2018. 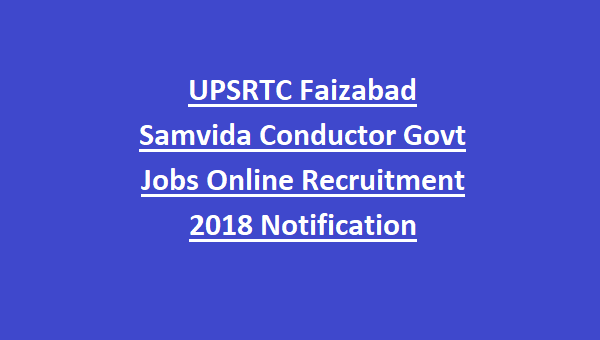 For other details of age limit, selection process, application fee and how to apply are given below for the conductor posts in UPSRTC Faizabad Samvida Recruitment Notification 2018. Based on category wise the number of vacancies will be updated soon. The age limit for the candidates applying for conductor posts is in between 18 – 40 years. For the upper age limit relaxation, candidates will refer in the official notification. The educational qualification for the UPSRTC Faizabad Samvida Conductor Jobs is candidates should have done Intermediate from recognized University. 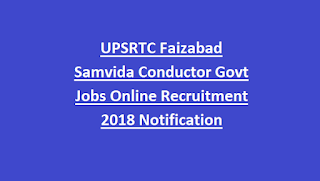 The application fee for the UP Samvida Conductor Jobs Recruitment in Faizabad is Rs.200/- for General/OBC category candidates and Rs.100/- for SC/ST category candidates. The selection process for the candidates to the Conductor Jobs in Faizabad Samvida Recruitment will be based on their performance in interview. The shortlisted candidates have to deposit Rs.10000/- for security purpose and the candidates training will be conducted in Faizabad Depo Training Centers. Interested candidates can apply for the conductor Jobs in UPSRTC Faizabad Samvida Recruitment through online official website portal of Ayushi Computers Private Limited is www.ayushicomputers.org from 15-10-2018 onwards. The closing date to submit the application form along with the relevant documents and Photograph with signature is on or before 25-10-2018. Candidates can pay the application fee at the time of form submission through credit card/debit card/net banking.